Princess' Paper Projects: Little Red Wagon Challenge #398 ~ Dogs or Cats??? Little Red Wagon Challenge #398 ~ Dogs or Cats??? I am a cat person. I don't mind dogs that I know but am not too fond of all dogs, probably because I have never owned one. 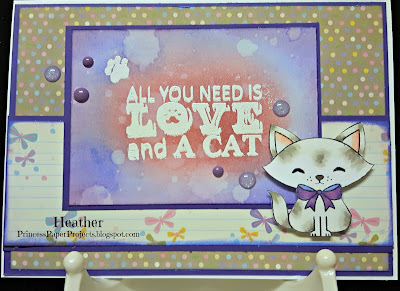 My card features a cat from the A Purr-fect Day set by Kraftin' Kimmie. I tired to colour her like a Siamese cat but I thinks she just looks more like a grey spotted one in the end. The sentiment is on water colour paper, heat embossed in white and then I used distress ink over it. Patterned paper is Simple Stories Enchanted. So, why not head over to the Little Red Wagon blog and check out the fantastic inspiration from all of the other girlfriends. While you are there, how about linking a cat or dog project of your own? Thanks for dropping by. Come back on the weekend to see all of the custom orders I have been working on for Father's Day. Super cute! I love dogs, so this sounds like a fun challenge. You need to have an affiliate link for Kraft' Kimmie. This is so darn cute! Don't you love this DI oxides? 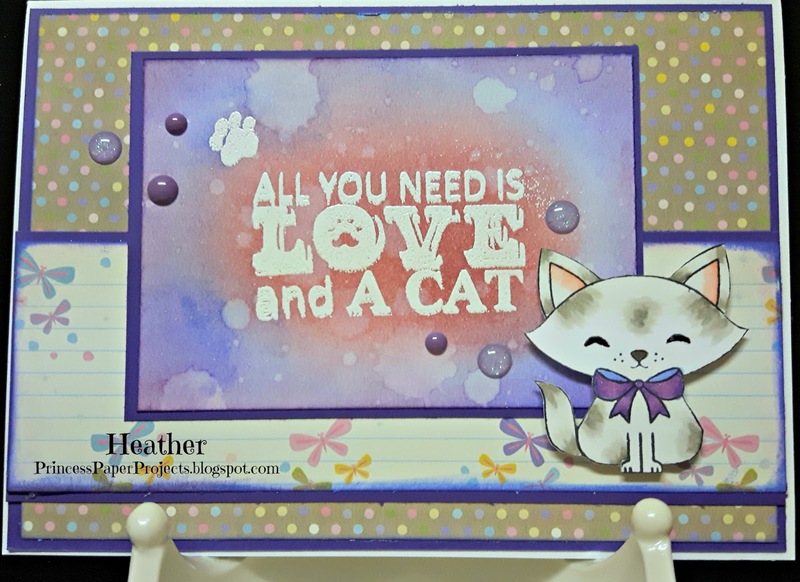 The sentiment looks fantastic with the watercolor background and I love how you colored the kitty. Darling card! So cute! I love how you did the sentiment! Great card Heather! That sentiment looks great and I think your kitty dies look lovely i.e. a siamese!